Renew your existing Pro Tools Ultimate annual subscription for a further 12 months. Continue to take advantage of some of the most advanced tools to quickly and precisely edit tracks as well as 25 bonus plug-ins including compressors, limiters, reverbs and more. 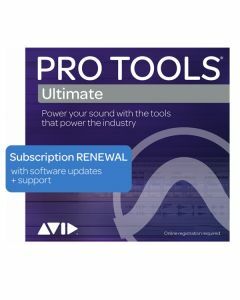 Subscription ends 12 months after activation date and will need to be renewed before the end of this term if you wish to continue to use Pro Tools Ultimate. â€¨Ever jam along to a song and nail the perfect run before hitting record? With retrospective MIDI recording, Pro Tools goes into “listen” mode even when you’re not recording, so you can retroactively drop those inspired improvisations into a track post performance, without missing a beat.